On Monday, Environment Canada was expecting 'a long period of snowfall with total amounts of 15 to 25 centimetres,' with the greatest accumulation likely to be on the Vancouver North Shore and Vancouver Island. British Columbians are bracing for more snowfall after a weekend of unusual winter weather. On Monday, Environment Canada issued a snowfall warning for multiple regions of the province, including Metro Vancouver. 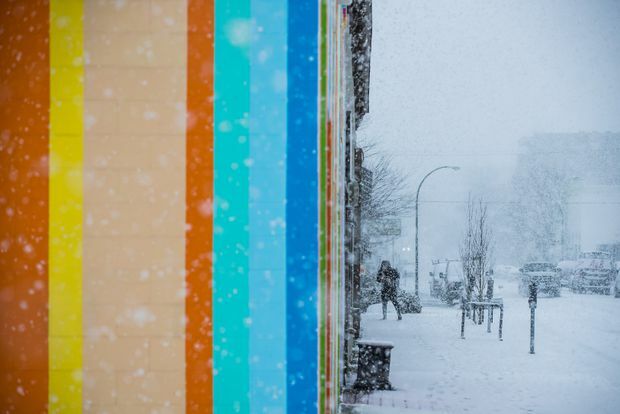 The weather agency was expecting “a long period of snowfall with total amounts of 15 to 25 centimetres," with the greatest accumulation likely to be on the Vancouver North Shore and Vancouver Island. The warning comes just days after a windstorm on Saturday severely damaged a marina in Horseshoe Bay, B.C. Greg West, a research associate with the Weather Forecast Research Team at the University of British Columbia’s Earth, Ocean and Atmospheric Sciences department, said the unusual winter weather was similar to the polar vortex that hit Eastern Canada in January. When polar vortex circulation is strong, Mr. West explained, cool air circulates around the poles. But weak circulation can lead to deviations and cooler winds make their way south. The Fraser Valley area is still experiencing extremely strong outflow winds – winds that accelerate when exiting a valley or coastal inlet. On Monday, Environment Canada issued a warning for “extremely strong outflow winds” in Whistler with temperatures near minus 20. Windstorms on the weekend caused more than 70,000 BC Hydro customers to lose power. The BC Hydro website said more than 3,000 customers remained without power as of Monday morning, most of them on eastern Vancouver Island. But Hydro said crews were making steady progress following weekend storms, although challenging conditions were complicating efforts. Mr. West said the effects of the polar vortex can last between one and two weeks. Vancouver’s temperatures are expected to moderate toward the end of this week, but an overall cool pattern will persist. Temperatures are expected to rise to four degrees on Saturday. Outflow winds, frigid temperatures and snow are the three most significant consequences of the polar vortex, according to Mr. West. BC Ferries cancelled Monday evening sails for the last round trip on major routes due to the expected snowfall. These routes included Tsawwassen-Swartz Bay, Tsawwassen-Duke Point, Horseshoe Bay-Langdale and Horseshoe Bay-Bowen Island. “When we look at the road conditions that were out there last night, the police closed the highway for a period of time out to our Swartz Bay terminal,” said Deborah Marshall, executive director of public affairs at BC Ferries. Ms. Marshall said thousands of customers were affected by the cancellations on the weekend.